Long ago a pun popped in my head, “I wish you were hair.” Not sure why, but often these types of play on words rumble around in my head, gaining momentum and gathering other disassociated ideas and images – kind of like a rolling tumbleweed. 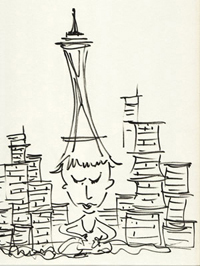 Playing with pens and paints can be as fun as playing with words, and I began a series of sketches that morphed famous world monuments into crazy hairstyles. Before there was email and Instagram, people used to mail postcards with pictures from well-known vacation spots, writing “wish you were here” to their family and friends from great places they visited. World monuments have always fascinated me — for their diversity and artistic vision — but also I associate them with an individuality of place. While there are still incredible differences around the world, in some ways, cities are becoming more alike as chain stores and restaurants pop up and some iconic landmarks and landscapes disappear. I feel a kind of nostalgia for some of these places as they disappear. If the analogy of sending postcards holds up, it seemed appropriate to send one about sewing to Quilt National. In my quilt, a giant pixie woman with Seattle Space Needle hair is threading a needle, sitting cross-legged between colorful spools of thread that in the distance becomes the skyscape of Seattle. To come up with ideas for my Wish You Were Hair series, I play around with ink and watercolor paints to create quick sketches in a relaxed or vacation place in an attempt to merge memory, imagination and bizarre associations. Then I work to translate that sketch into fabric and thread, but also attempting to keep a kind of fresh spontaneity. Quilt making is such a long process, and it is difficult to keep from becoming stifled or over-working the process. 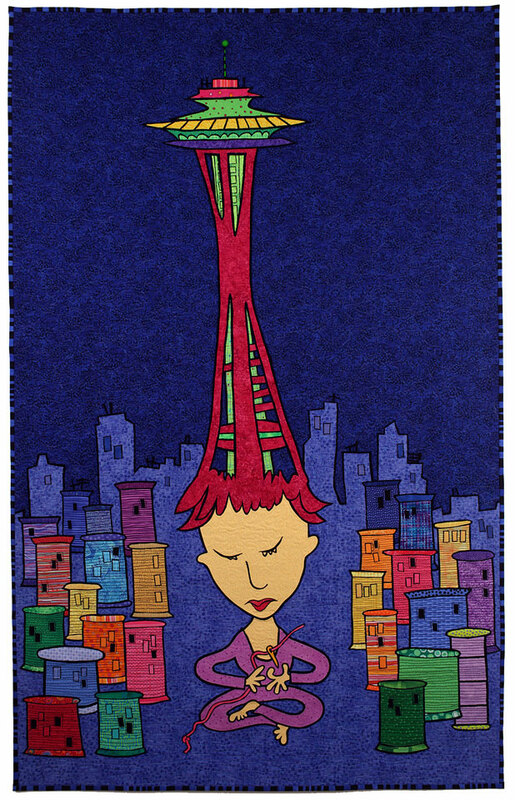 I was happy that my quilt Seattle: Wish You Where Hair turned out colorful and playful, and that it was selected for the Quilt National 2013 exhibition. But when I visited the opening of the exhibition at the Dairy Barn Arts Center in Athens, I remembered something that I knew from previous exhibitions. 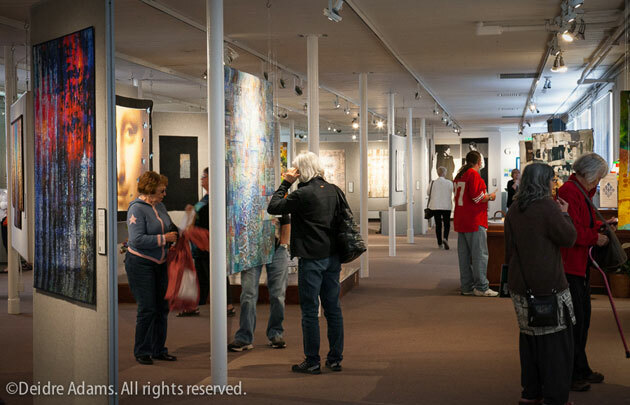 Every artist in Quilt National is a master at presenting a fresh exploration and approach to the medium and creating vibrant works of art, and I’m honored to be part of the exhibition. 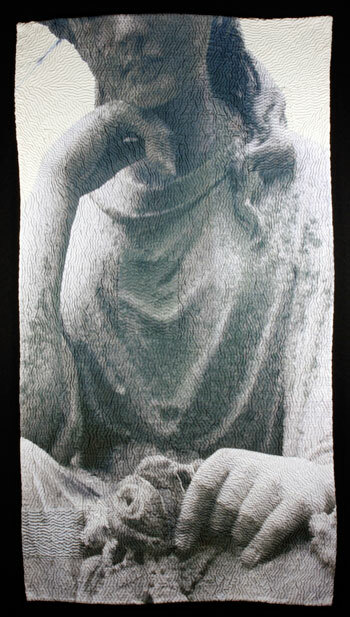 You can see my three-minute artist talk at the Quilt National 2013 opening weekend on YouTube by clicking here. Click here to see more of Pam RuBert’s work. 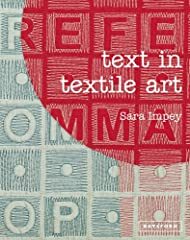 Quilt National artist, Sara Impey‘s book Text in Textile Art is now available in the UK. This book includes work by other Quilt National artists including Susan Shie and Robin Schwalb. The book is a practical and inspirational book about the use of text in textile art, illustrated with work from some of the world’s leading textile artists. The publishers are Anova Books Company Limited. 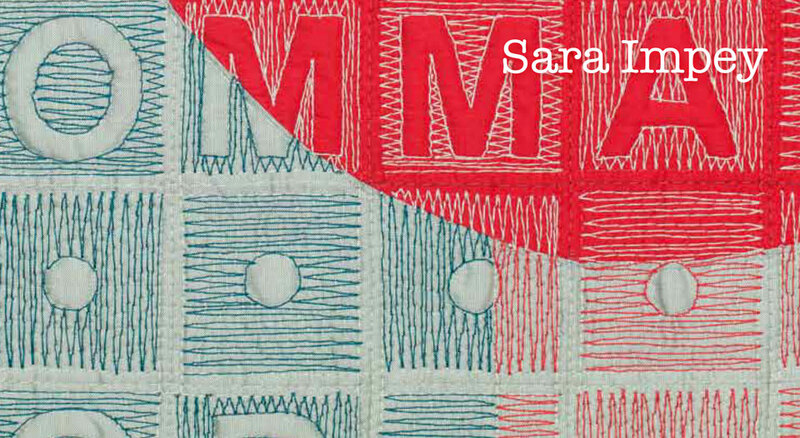 Text in Textile Art is available now online in the UK from BookFellas, and will soon be available from Amazon.com in the U.S. You can pre-order Sara’s book from Amazon by following the links below. 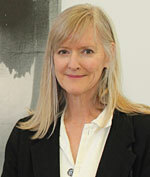 Deidre is preparing for a residency at Vermont Studio Center. She will spend 4 weeks in total art-making immersion, surrounded by creative artists and writers, focusing on her creative practice and expanding a new body of work. The cost for this opportunity is not insignificant, so in order to be able to fund it she is holding a studio sale, offering some of her older work at reduced prices. Please take a look by clicking here.